On November 4, 2017, speaking shortly after the bicentennial of General Thaddeus Kościuszko’s death, Dr. Marek Chodakiewicz opened the 10th Annual Zdzisław Zakrzewski Kościuszko Chair Conference. This year the topics focused on Russian foreign policy and Polish history. The second session examined Poland’s history, from the golden years of the Polish-Lithuanian Commonwealth to the tragedies and travails of Poland during the Second World War. At the end of the conference, Dr. Tomasz Sommer premiered his groundbreaking documentary on the Anti-Polish Operation of the NKVD: Shoot the Poles. Drawing on hitherto unknown NKVD documents, Dr. Sommer pieced together the democide of nearly 200,000 Poles living within the Soviet Union in 1937 and 1938. The screening of the film was made possible thanks to the generosity of the Bak Foundation. 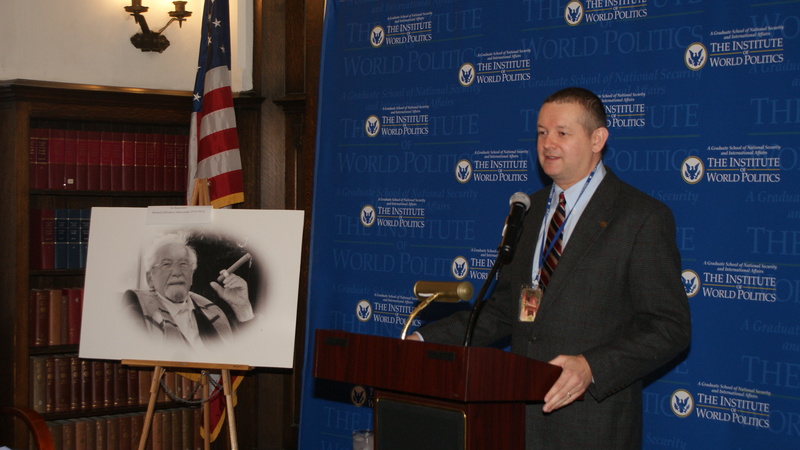 Marek Jan Chodakiewicz, Ph.D., the Head of the Kościuszko Chair of Polish Studies at The Institute of World Politics, briefly discussed the part our patron played in the US history. 2. Is Russia at War with the U.S? Mr. David Satter affiliated with the Hudson Institute and the Johns Hopkins University School of Advanced International Studies (SAIS) discussed Russia’s road to dictatorship and terror under Yeltsin and Putin and how it led to Russia’s interference in U.S. internal affairs. Mr. Piotr Trąbińsk, a law graduate from the University of Warsaw with extensive experience in international banking, and a student of IWP, explained how technological advancement of 21st century gave Russia a new perspective and capabilities to project its power within the sphere of foreign relations and cyberspace. His presentation reviewed the way in which active measures were deployed in the past and how they are applied in the digital context at present. 4. Polish Lithuanian Commonwealth – The United States before The United States? Mrs. Maria Juczewska, an Associate Director of the Kościuszko Chair of Polish Studies, analyzed in what way the Polish-Lithuanian Commonwealth resembled the United States of America in the pre-modern era. Similarities between the two political entities were presented, pointing to analogies between the two systems of government and the thoughts and attitudes that spawned them. Professor Jakub Isański, Adam Mickiewicz University in Poznan, spoke on mass migrations, which began in the Polish lands already in 1944 and lasted until the end of the 50s. Their effect was the displacement of more than a dozen million people into unfamiliar, alien lands. The lecture focused on the excerpts of the migrants’ diaries from the corpus of over one thousand works, digitized and subjected to qualitative analysis. by Dr. Tomasz Sommer, a Polish writer, journalist, publisher, and Editor-in-chief of the Najwyższy CZAS! weekly. He is one of the foremost Polish experts focusing on the Polish aspects of Stalinism, in particular the Polish Operation of NKVD. His is the first documentary about the Anti-Polish Operation of NKVD in the years 1937-38. The operation was a planned genocide of the Poles living in USSR shortly before the start of World War II. Organized extermination of 200,000 Poles has remained a secret for decades – until recently. This entry was posted in Uncategorized on November 17, 2017 by liberska. On November 12, 2016, The Ninth Annual Kościuszko Chair Conference took place. Topics covered a number of problems related to Poland’s past and presence, such as the Jewish autonomy in the Polish-Lithuanian Commonwealth, rigged elections in January 1947, energy and cyber security in the EU as well as the reasons for emigration of the youngest generation of Poles in the 21st century. Mr. Adam Sieminski, U.S. Department of Energy, discussed the international energy outlook and challenges to energy security in the United States and in Europe. Mr. Michael V. Szpindor Watson, George Mason University Ph.D. Candidate, elaborated on the disagreement between whether the Jews were treated better in royal or private noble towns. He analyzed where peace was best fostered, comparing the two types of towns. Mr. John Armstrong, an independent scholar, discussed the January 1947 Elections that changed the course of Polish history after WWII. Mrs. Maria Juczewska, Kościuszko Chair of Polish Studies, analyzed complex reasons for the massive emigration of young Poles at the beginning of the 21st century. Mr. Piotr Trąbinski, an IWP M.A. candidate, discussed the development and the recent phenomena in Russian cybernetics.